Shrugs, like the classic black evening dress or the all so necessary pair of jeans and classy jacket, is considered as an essential staple in any woman's wardrobe. Not only is this piece of Ladies Clothing an element of fashion nowadays rather it can also be opted as an additional covering of fabric to offer warmth in cold areas. To know more about ladies shrugs, read on ahead. Defined simply a Shrug is a garment resembling a cropped cardigan that is not buttoned or closed like a cardigan rather it finishes at the women's breast bone. Closely related to sweaters, womens shrugs are often found in light fabrics or knits that softly cling on to the body. The number of fabrics, colors and patterns available in Shrugs Online in Pakistan today are literally infinite and everyone can choose one based on their personal preference. Shrugs Online Shopping in Pakistan is getting popular day-by-day as it allow you to sit back relax and get your desired girls shrugs at your doorstep. Tie-Off Shrugs: These Shrugs contain two long strips at the end of the material to tie off at the bottom in a knot or a bow. Cropped Shrugs: This type of shrug does not tie off and is shorter in length ending anywhere from under the armpit to a few more centimeters below. Shawl Shrugs: Evident by its name this type of shrug is a larger structure of clothing that can be wrapped around imitating a shawl. Usually these types of shrugs add in more flow and at times volume to the shrug's appearance. Shrugs Style Tops: Shrugs Style Tops are trending this season, as it perform 2 in 1 function. These are actually tops which are designed to look like wearing Shrugs from front. Fashion Shrugs in Pakistan today are continuously used as an added accessory to wear along your usual evening attire. Usually a component of casual dressing up, pairing it with a nicely fitted pair of jeans and tank is the popular way of carrying it. Add on some drop earrings and a stylish belt to your super looks to feel grand in a casual dress form. While finding a stylish shrugs for women nowadays is far easier today owing to the importance the dressing item has managed to gain in the past years. However, to access more variety on designs, material, colors and patterns, shrugs online shopping in Pakistan is the best way to find the best shrugs that compliments you completely. 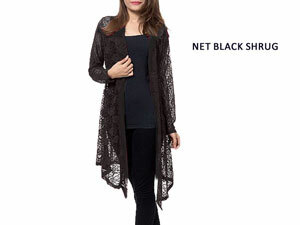 PakStyle.pk carry variety of ladies shrugs including long sleeve shrugs, shoulder shrugs, lace shrugs, crochet shrugs, net shrugs, cotton shrugs, plain shrugs and shrugs style tops in all colors including black shrugs, blue shrugs, beige shrugs, grey shrugs, green shrugs, pink shrugs, red shrugs and yellow shrugs. Ladies Shrugs Price in Pakistan starts from Rs.500 based on quality and material. 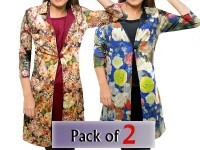 Buy Shrugs Online at Lowest Price from PakStyle.pk as the company offers Shrugs bundle offers that allow you to save money on shrugs with Free Home Delivery offers.